The original BugPellent is a natural solid insect repellent with patented vapor release design. 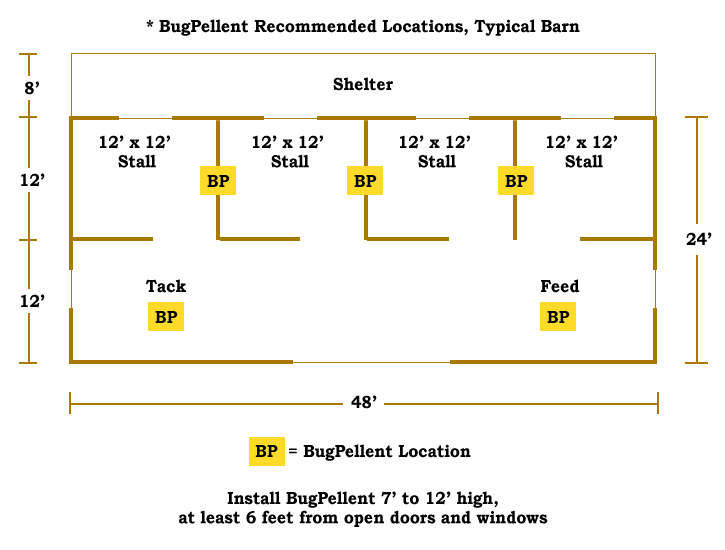 The recommended usage* is to hang two to four over a stall that has a ceiling. Put one on the outdoor side and one on the breeze way side. Four per stall work best if you have heavy fly pressure coming from neighbors or not using Fly Predators. These need a ceiling to work, so the aromas don’t just go up in the air. The hanging BugPellent unit cost just $13.95 each (A), and a two package refill (B) is $18.95. Even if you have hardly any flies, you might consider the BugPellent to make your barn or kennel smell nicer. However, this does nothing to stop ammonia. You need Bye Bye Odor for that. The same company makes an Essential Oil Fly & Tick gel that customers who have tested it reported it’s the best they’ve used. Ticks and fleas were practically nonexistent on dogs as were ticks on horses that had been previously effected. 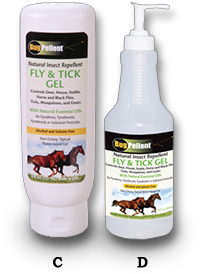 The Gel also repels the large nasty Deer and Horse Flies, House and Stable flies, Black Flies, Mosquitoes and Gnats. For horses apply liberally on the lower leg area around coronet bands and pastern. For dogs, the back of the neck area continuing on the back to the tail and on the legs is best. The 8 oz. Gel (C) is $7.95, the 16 oz. Gel (D) is $12.95. Based on the quantity of product(s) selected we will need to get you in touch with one of our Spalding Labs agents to help complete your order. You can reach us at 888-562-5696 to place your order.